2011.03.28The 3rd Okinawa International Movie Festival has successfully ended. We promise that all of your supporting yells will be delivered to the Tohoku earthquake disaster relief. Thank you very much to all for coming. And Okinawa people, see you again next year! 2011.03.27"Hankyu Train" wins both the Golden SHISA Award and the Uminchu Prize! 2011.03.05We've released our screening schedule! 2011.02.28Ticket information on Featured Program and Local Origination Project is now released. 2011.02.22Click here for the 3rd Okinawa International Movie Festival Press Conference held on February 22. 2011.02.22All of the featured titles in the Featured Program Laugh Category and Peace Category are now released!! 2011.02.22General information on the Laugh & Peace Countdown Festa events and screenings are now released! 2011.02.10Official goods for the 3rd Okinawa International Movie Festival are now released! 2011.02.10JIMOT CM COMPETITION nominated commercial ideas are now released!! 2011.1.28Begin entry of videos for World Wide Laugh! 2010.12.153rd Okinawa International Movie Festival - Now recruiting volunteer staff!! 2010.12.08Jimot CM Competition <<Give a shout for your hometown>> Send in your ideas now! 2010.12.083rd Okinawa International Movie Festival - Press registration details released! 2010.12.08Region of origin movie outline released! 2010.12.08World Wide Laugh <<Break through language barriers with laughter!>> Details announced! 2010.12.08Enter your Featured Program works now! 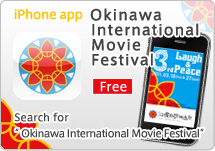 2010.12.083rd Okinawa International Movie Festival - Official app released! 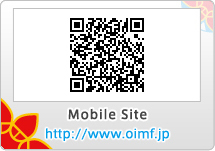 2010.12.083rd Okinawa International Movie Festival - Official site is now open! Mobile site also renewed!